This review originally appeared in the September 2003 issue (#181) of The New York Review of Science Fiction. 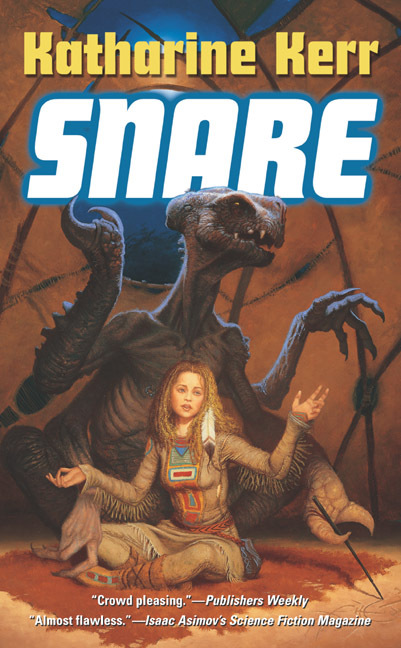 One of the primary definitions of the word ‘snare’ in the Merriam Webster Dictionary is “something by which one is entangled, involved in difficulties, or impeded.” With that in mind, I couldn’t help but wonder if Katherine Kerr was attempting some sort of bold statement with the name of her most recent novel, Snare. Was she trying to convey that the world of this novel might just entrap the reader just as it has entrapped its occupants?